The perfect dishes for daredevil eaters, from 1,000 year-old eggs to newborn rodents. 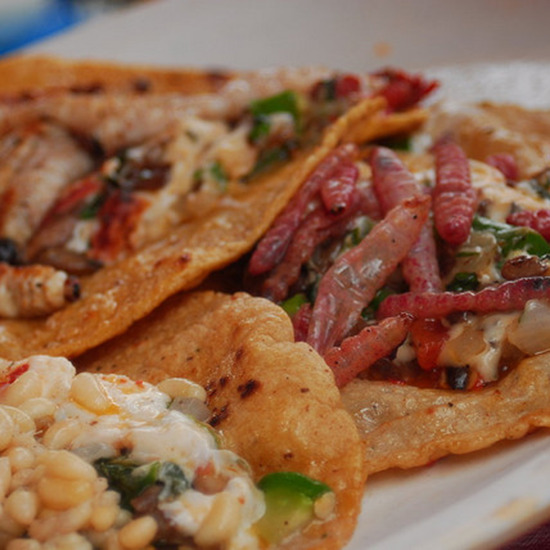 In Mexico, black ant eggs are called "insect caviar." For centuries, they've been harvested from the insect's underground nests on agave and maguey plant roots, then boiled, cooked in creamy soups, simmered in tomato sauce, or served with guacamole and tortillas. Those who enjoy escamoles say they're creamy like cottage cheese, with a buttery, nutty flavor. 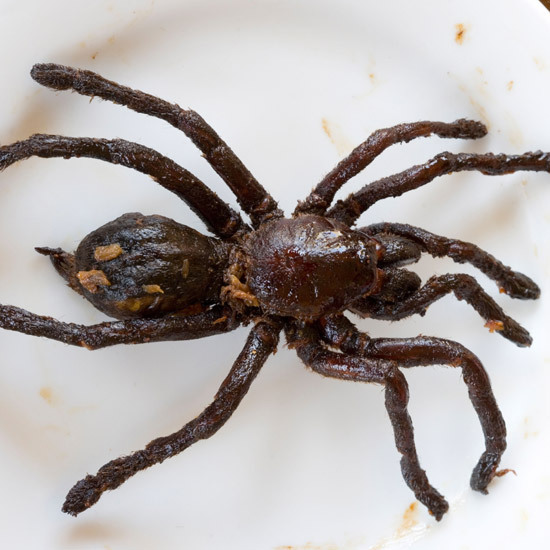 A palm-sized species of black tarantula known as "a-ping" is a well-known culinary specialty of Skuon, a small Cambodian village north of Phnom Penh. The rural area is sometimes called "spiderville" for the street vendors selling heaping trays of whole arachnids, which are bred in underground lairs and fried with garlic, sugar, spices and salt until their legs are crispy and their bodies turn a dusky red. Also known as Sardinian maggot cheese, these pungent rounds are made from the sheep's milk cheese called pecorino. Available only on the black market, they're allowed to reach an advanced stage of fermentation, becoming soft, wet and covered with larvae from the cheese fly. (Casu marzu means "rotten cheese" in Sardinian.) 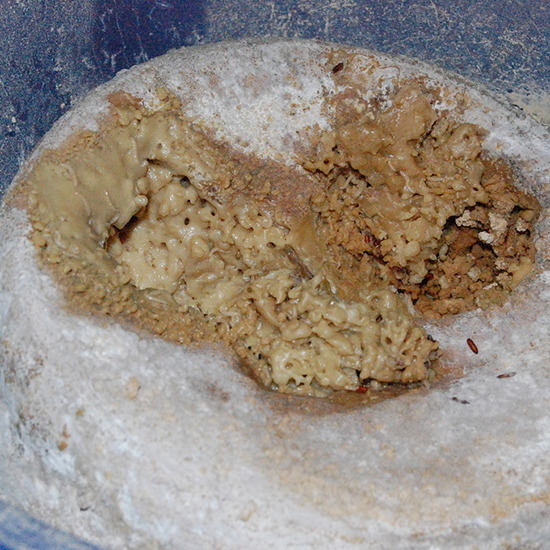 Some diners are said to clear the cheese of larvae before eating it; others consume the stinking cheese as-is. The Chinese cover raw eggs—duck, chicken and sometimes quail—with a mix of clay, ash, quicklime, salt and straw and let them sit for weeks or months to cure. 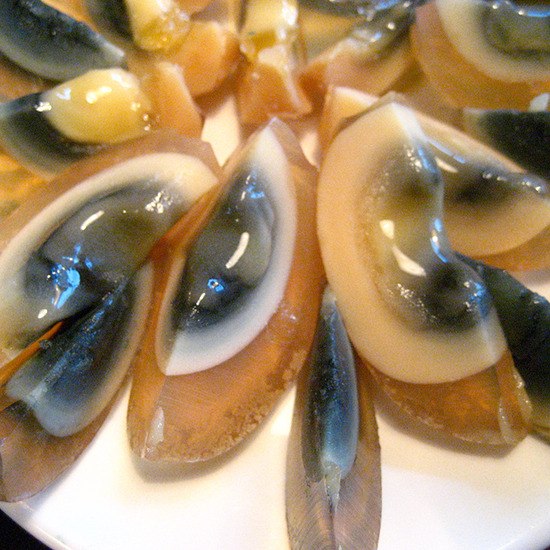 The yolks turn deep-green and soften; the whites disintegrate into a transparent amber jelly. Reeking of sulphur, they're served with silken tofu or pork, scallions and ginger, in the rice porridge known as congee, or simply as part of a banquet platter of cold finger foods. 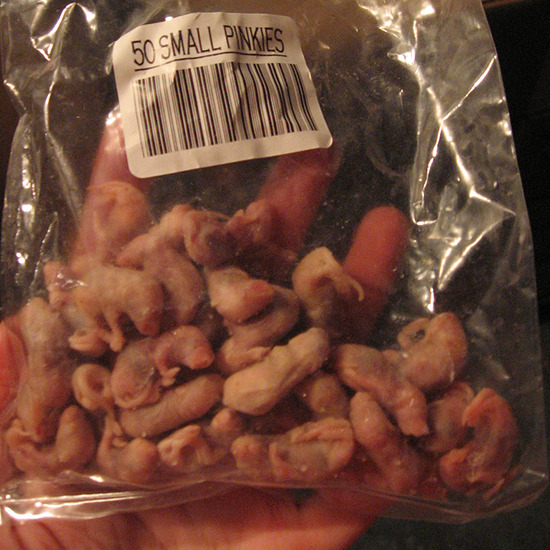 In some parts of Asia newborn mice and rats—sometimes called "pinkies"—are eaten whole, either crispy fried or grilled, such as the way author Jerry Hopkins samples them in his 2004 book Extreme Cuisine (Periplus Editions). Hopkins had them like spring rolls: with a traditional Vietnamese dipping sauce of ginger, garlic, chilies, cilantro, fish sauce and rice vinegar. 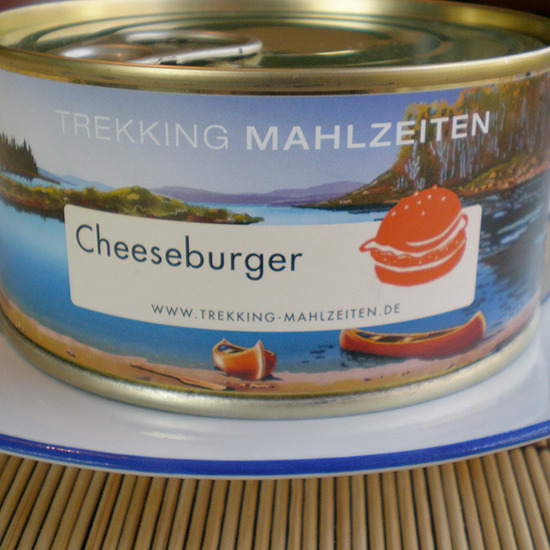 Produced by the German company Trekking Mahlzeiten as a snack for those on the move—"Trek 'n Eat," the German-language site proclaims—these slim pop-top tins are labeled simply "Cheeseburger" and feature a pair of canoes pulled up to the shore of a forest-rimmed lake. These burgers aren't intended to be grilled over a campfire, however. Instead, you heat up the cans in boiling water.